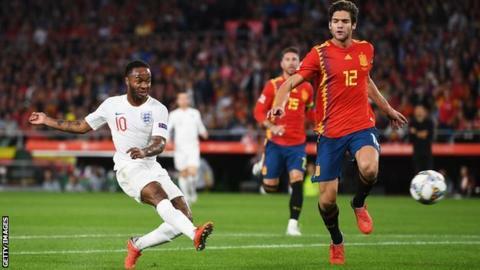 England won in Spain for the first time in 31 years as they recorded a memorable Uefa Nations League win over Spain in Seville. Gareth Southgate’s side were 3-0 up after a sensational first half, Raheem Sterling ending a three-year and 27-game barren sequence with a thunderous early opener and he was on the mark from close range for the third before the interval, with a composed strike from Marcus Rashford sandwiched in between. Spain, torn apart by England’s pace in those opening 45 minutes, responded in predictable fashion in a chaotic second period as Paco Alcacer pulled a goal back just before the hour with a near-post header. England lived on their nerves, particularly goalkeeper Jordan Pickford, whose exceptional ability with the ball at his feet helped create their first two goals but was also lucky to survive a penalty appeal when he seemed to bring down Rodrigo after attempting to be too clever in his own area. 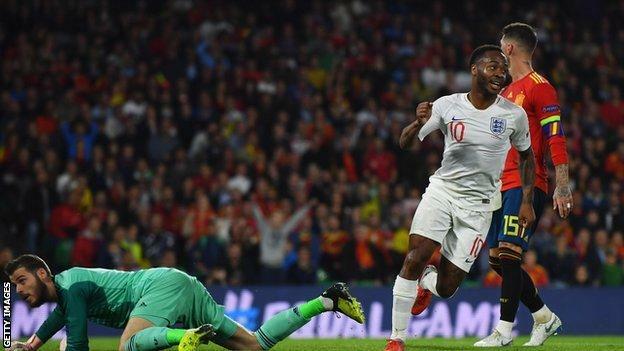 Spain hit the woodwork and Sergio Ramos scored with the final act of the game in the 97th minute – but England survived to secure a famous and deserved victory, their first here since a 4-2 win in 1987 and in a country that has rarely tasted defeat on its own turf. This was their first loss at home in a competitive fixture since 2003. How did you rate the Spain and England players? Southgate, despite the comparative success of reaching the World Cup semi-final, insisted his side could not rank themselves among the world’s top teams until they started beating top teams. The win against then World Cup holders Germany in March 2016 proved a false dawn and the question persisted as they lost twice to Belgium in Russia, to Croatia in the semi-final in Moscow and to Spain in the Uefa Nations League reverse fixture at Wembley in September. Can this dramatic night in Seville be the landmark moment, the statement victory, that Southgate has been demanding? England lived on their nerves for much of the second half as Spain applied constant pressure until the 97th minute but the celebrations of players and supporters at the final whistle illustrated the magnitude of this England win. Spain were resurgent under Luis Enrique and had not lost at home in a competitive game since they were beaten by Greece in June 2003 – 5,609 days ago. And yet, after surviving a torrid opening, England’s pressing and pace tore Spain to pieces in the first half. The Spanish dominated possession but England had the potency and end product with those three goals. Captain Harry Kane was the workhorse and creator while Sterling and Rashford provided the finishing flourishes that put England in dreamland at the interval. They had to dig deep and rode their luck through a succession of second-half scares but that was inevitable against a side of Spain’s quality. They also showed courage, resilience and a tireless work-rate. This is a win that also eases those nerves about relegation from their Uefa Nations League group and puts them in a much more healthy position before their meeting with Croatia at Wembley. Sterling was not hiding away from cold reality when he addressed the media after Friday’s goalless draw against Croatia behind closed doors in Rijeka – he simply had to start scoring for England. As the action got under way in Seville, it was three years, 27 games and 1,810 minutes since he scored in the 2-0 win over Estonia at Wembley. The pressure to deliver was mounting and it was perfectly natural that questions were being asked about how long this record could be sustained, but Sterling answered them in the most emphatic fashion possible after 15 minutes. Pickford’s superb pass started the move and when Kane played Sterling through he fired unerringly and without hesitation high past David de Gea. The shackles were off and the player whose club form is such a contrast to his international returns – he has scored 34 goals in 97 appearances for Manchester City in that same three-year period – was electrifying. Sterling added his second to give England that 3-0 lead before half-time but he also gave a complete performance of pace and running, and was unlucky to be denied a penalty in the second half. He was a threat every time he had the ball. Southgate has always felt the goal was coming for Sterling – now he will hope for further rewards. In his media briefing before this game Spain coach Luis Enrique was asked whether he could believe how well his early days had gone after thrashing Croatia at home and Wales away – but the party came to an abrupt end here in Seville. The whistles at half-time were as much from disbelief as disappointment as a Spain side used to having it all their own way at home were being run ragged on their own turf. England were devastating. Spain were stunned. This country has been an impregnable football fortress in the modern generation and this was the end of a 38-game unbeaten run, the first time in their history that they had conceded three goals at home in a competitive international match. It was the first time they had conceded three goals at home in the first 45 minutes of an international since Scotland scored four in their 6-2 win at the Bernabeu in June 1963. All these glorious statistics came tumbling down around Spain as England restored the feelgood factor that sustained them through the World Cup in Russia in the summer. This was a memorable night and one of the finest in England’s recent history. England manager Gareth Southgate told Sky Sports: “The players should be incredibly proud of their performance. We spoke to the forward players before the game to remind them what a threat they are and they were outstanding, causing all sorts of problems. This was England’s first victory – and first goals – in an away match against Spain since February 1987, when Gary Lineker scored all four goals in a 4-2 victory. Spain lost their first competitive home international since June 2003 vs Greece, ending a run of 38 games without defeat. This was the first time in their history Spain had conceded three or more goals in a competitive home international match. England scored with all three of their shots on target in the opening 45 minutes – they did not have a single effort on goal in the second half. Raheem Sterling’s goal was his first for England since netting vs Estonia in October 2015 – ending a run of 1,825 minutes and 27 games without one. Sterling scored twice in an England match for the first time, while it was also the first time Harry Kane had provided two assists in a match for the Three Lions. Marcus Rashford has scored three goals in his past four appearances for England – as many as he had in his previous 25. Harry Kane has been directly involved in 39% of the 44 goals England have scored under manager Gareth Southgate (14 goals, three assists). England face the USA in a friendly on 15 November (20:00 GMT) at Wembley, while Spain host Bosnia on the same evening (19:45 GMT). Match ends, Spain 2, England 3. Álvaro Morata (Spain) is shown the yellow card. Second Half ends, Spain 2, England 3. Goal! Spain 2, England 3. Sergio Ramos (Spain) header from the centre of the box to the bottom right corner. Assisted by Dani Ceballos with a cross. Corner, Spain. Conceded by Ben Chilwell. Attempt missed. Paco Alcácer (Spain) header from the centre of the box is just a bit too high. Assisted by Marco Asensio with a cross. Attempt missed. Sergio Ramos (Spain) header from the centre of the box misses to the right. Assisted by Thiago Alcántara with a cross following a corner. Corner, Spain. Conceded by Joseph Gomez. Substitution, England. Nathaniel Chalobah replaces Harry Winks. Foul by Álvaro Morata (Spain). Raheem Sterling (England) wins a free kick in the defensive half. Dani Ceballos (Spain) is shown the yellow card for a bad foul. Foul by Dani Ceballos (Spain). Marcus Rashford (England) wins a free kick in the defensive half. Attempt blocked. Paco Alcácer (Spain) left footed shot from the centre of the box is blocked. Assisted by Jonny. Attempt missed. Álvaro Morata (Spain) with an attempt from the centre of the box misses to the left. Assisted by Jonny with a cross. Substitution, England. Trent Alexander-Arnold replaces Kieran Trippier. Paco Alcácer (Spain) wins a free kick in the defensive half. Attempt missed. Marco Asensio (Spain) left footed shot from outside the box is close, but misses to the right. Assisted by Jonny. Attempt missed. Thiago Alcántara (Spain) right footed shot from outside the box is close, but misses to the left. Assisted by Paco Alcácer. Foul by Sergio Busquets (Spain). Attempt missed. Paco Alcácer (Spain) right footed shot from the centre of the box misses to the right. Substitution, England. Kyle Walker replaces Ross Barkley. Jonny (Spain) is shown the yellow card for a bad foul. Ben Chilwell (England) wins a free kick in the defensive half. Offside, England. Joseph Gomez tries a through ball, but Marcus Rashford is caught offside. Substitution, Spain. Álvaro Morata replaces Rodrigo Moreno. Attempt missed. Marcos Alonso (Spain) left footed shot from outside the box is too high from a direct free kick. Harry Maguire (England) is shown the yellow card for a bad foul. Dani Ceballos (Spain) wins a free kick in the attacking half. Delay in match Harry Maguire (England) because of an injury. Corner, Spain. Conceded by Marcus Rashford. Corner, Spain. Conceded by Kieran Trippier. Sergio Ramos (Spain) is shown the yellow card. Harry Winks (England) is shown the yellow card.